WE CAN RE-COLOUR AND SEAL YOUR GROUT TO A BETTER THAN NEW FINISH WITH NO DUST OR MESS. THIS METHOD CAN BE USED TO RESTORE OLD AND DISCOLOURED OR STAINED GROUT OR IT CAN BE APPLIED TO A NEW INSTALLATION TO PREVENT STAINING AND TO KEEP IT LOOKING NEW FROM THE START. YOU CAN EVEN CHANGE THE COLOUR OF YOUR EXISTING GROUT. IT WILL TYPICALLY LAST FOR AROUND 15 YEARS ONCE TREATED OR LONGER WITH OUR ANNUAL MAINTENANCE PLAN. IT IS MORE COST EFFECTIVE AND INDEED MORE EFFECTIVE THAN RE-GROUTING OR APPLYING VARIOUS CLEANERS OVER A PERIOD OF TIME. WE OFFER A FULL LIFETIME WARRANTY IF OUR MAINTENANCE PLAN IS TAKEN OUT AND A 12 MONTH WARRANTY IF NOT. YOU WILL BE AMAZED AT THE TRANSFORMATION OF YOUR BATHROOM, KITCHEN OR INDEED ANY ROOM WE TREAT AS IT WILL LOOK AS IF IT HAS BEEN NEWLY INSTALLED FOR A LONG TIME AFTERWARDS. WE CAN ONLY OFFER THIS SERVICE CURRENTLY FOR CERAMIC AND PORCELAIN TILES. FOR NATURAL STONE INSTALLATIONS PLEASE SEE OUR OTHER SERVICES SECTION ON THIS WEBSITE. PLEASE RING FOR MORE INFORMATION OR TO ARRANGE A QUOTATION. We apply a pre treat cleaner to the grout joints and thoroughly clean the tiles. Once dry we then apply the grout colourant. We apply two coats of the grout colourant to ensure a uniform colour and this also seals the grout as well to protect it.
" I am so so pleased it is an amazing transformation as the tiles have been down for 23 years and the floor looks like new. I am not normally happy with any work done in the house but I am really happy with this 12 out of 10. I wont be putting my rug back down "
" WOW! 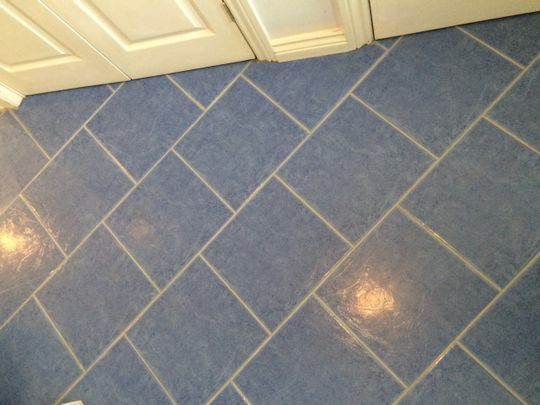 After years of cleaning the grout in the kitchen over and over and it still looking patchy, I cant believe I now have a floor that looks better than new. I am going to take you up on your annual maintenance plan to keep it looking good , thank you. "